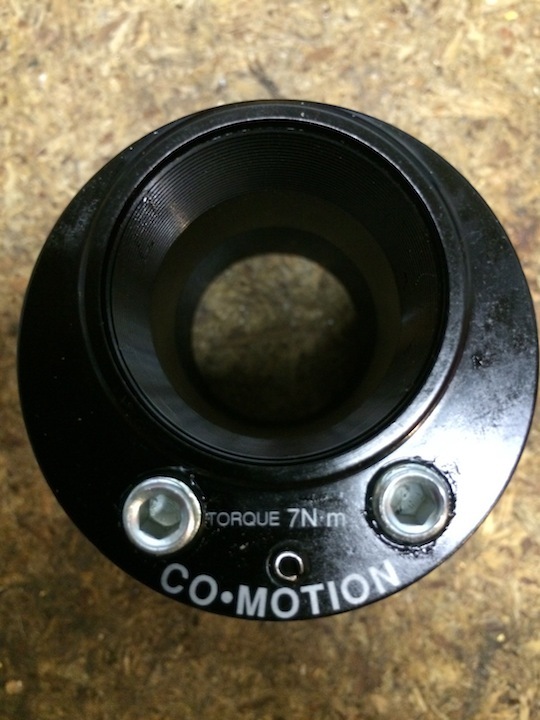 Final destination for an SKF bottom bracket: the Co-Motion eccentric bottom bracket shell. 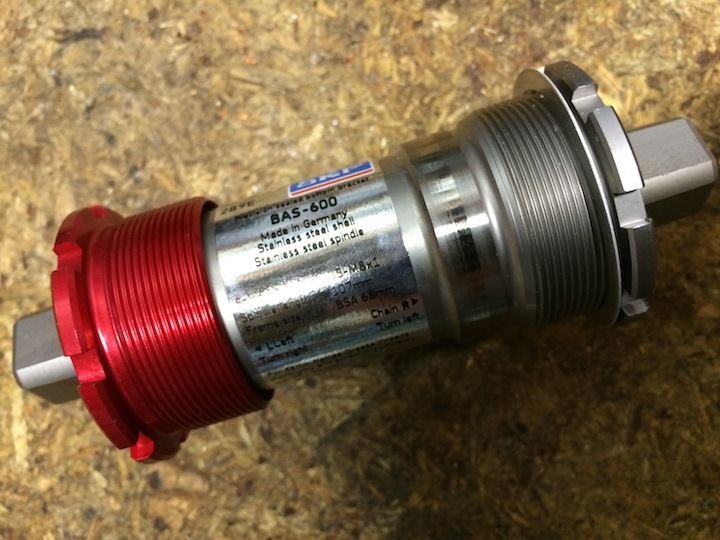 Executive summary: There are two ways to install an eccentric bottom bracket shell. One of them is wrong. When it comes to working on bicycles, having a process is great–as long as you recognize any changes in the work that might disrupt that process. If something changes and you don’t recognize it, an instinctual approach to the work is going to get in the way. Just like it got in the way when I was working on my Co-Motion tandem. Here’s the story. A single-rider bicycle has a right side and a left side. When you sit on the saddle, your right is the bike’s right. That’s good to know when you install a bottom bracket (the spindle and bearings between the right and left crank arms). 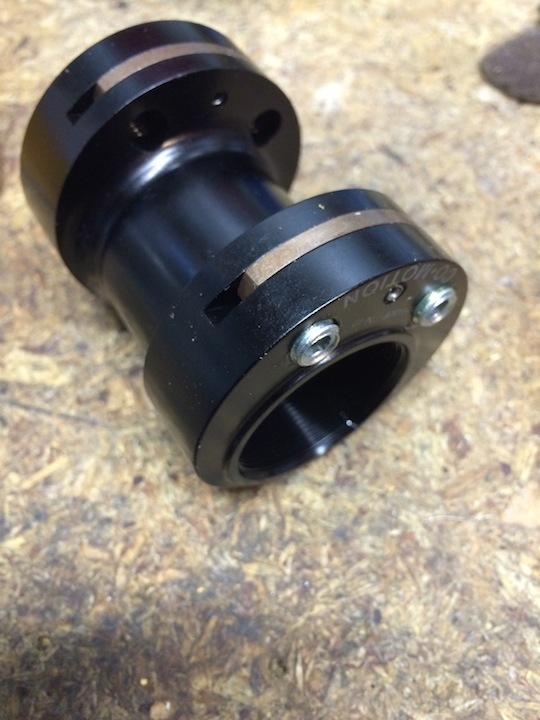 On frames with English threading, the right bottom bracket cup has a left-hand thread, which means you install the cup by turning it counterclockwise. The left cup has a right-hand thread (the good ol’ righty-tighty, lefty-loosey variety). Park Tool’s explanation of this includes pictures. Tandems have a right side, too, but most of them also have a removable eccentric bottom bracket shell between the front cranks. I pulled the eccentric bottom bracket shell so I could clean the inside of the frame. I should have remembered to keep track of which end was which. The front bottom bracket threads into this shell. It is secured, off center, within the shell (hence the adjective, eccentric). When you install the eccentric and rotate it within the frame, the distance changes between the front and rear bottom brackets, which makes it possible to tension the chain that connects the front and rear cranks. Unfortunately, if you remove the bottom bracket from the eccentric and then, the eccentric from the frame, you may end up swapping the ends of the eccentric when you reinstall it. Which is what I did. The left side of the shell ended up on the right side of the bike. I couldn’t install my new SKF bottom bracket and I had no idea why. Bottom bracket orientation wasn’t part of my mental checklist. On a bicycle without an eccentric, the bottom bracket shell can’t be reversed. It’s brazed or welded or glued into the rest of the frame. The goal: installing a new SKF bottom bracket. The challenge: figuring out why it didn’t fit–at first. I didn’t think about the bike while I was reading. And, as often happens when I read, my eyes got tired and I put the book down. I still wasn’t thinking about the tandem. Shortly thereafter, seemingly ex nihilo, the solution revealed itself: Remove and reverse the eccentric shell. To be more precise, remove and reverse the eccentric shell, dummy. For me, it was Archimedes’ Eureka moment without the bathtub, which was great, because if I had to get naked every time I needed to solve a problem, I’d end up creating new problems no amount of book reading and napping could solve. Jim Langley has a nice illustration that links bicycle parts and their names. (Turns out my tandem really has four bottom brackets.) I get stumped by bicycles all the time, but usually things work out, like the time I was trying to keep a folding bike from creaking. This entry was posted in Co-Motion tandem, Equipment and tagged bicycle maintenance, bicycle repair, eccentric bottom bracket, tandem. Bookmark the permalink. The bike came with FSAs. Then I switched to 165mm DaVincis. Unfortunately, the BBs I got at the same time weren’t up to snuff. (You should have heard the creaking on Hilly Hundred.) So, for now, it’s DaVinci on SKF bearings. Just need to buff out the cranks–get back the shiny.